My father, Alan Dale Lawther, was born in 1925, in West Pascoe Vale (now Brunswick), Victoria. He was the 3rd child of William and Nellie Lawther. In 1939, at the age of 14, Alan left school and started a pharmaceutical apprenticeship with Morrison’s Pharmacy in Camberwell, however he did not complete it. He, like all young boys at the time wanted to go and help fight the war. His older brother Keith was already fighting and he wanted to join him. He enlisted on 14th January 1942 at Hawthorn Victoria and did his recruit training at Nagambie Victoria after which he was assigned to the 14th Australian Line Section. It wasn’t until 9 months later when Dad was on his way North that the army discovered that he was under age and as a result he was discharged on 9th September 1942, for having made a false answer on attestation. Six months after being discharged Dad turned 18. That same day, 15th March 1943, he re-enlisted. Two weeks later he was called up for full time service in the Citizens Military Force. On 21st April he transferred to the AIF. He was assigned to the 3rd Australian Division Signals as a linesman / signalman. His next trip north went a little further from QLD this time. He ended up in New Guinea – (The 3rd Division was deployed to New Guinea in early 1943) where he visited all the local tourist spots of the time – Port Moresby, Lae, Nadzab, Finschhafen and Madang. Dad told me it was very rough going because of the mountainous terrain; the steamy, dank, dense, tangled jungle; the fast flowing ice-cold creeks and incessant rain which meant he was always wet. He told us his socks rotted in his boots and he spent much of the time with no socks. His feet were sore and covered in blisters but he had to ignore the pain and keep going. He said at one time, he didn’t get to change his clothes for five months. He recalled being hungry and remembered the food he’d get, bully beef and biscuits, cocoa and also the cigarettes; he started smoking in the Army. His job as a linesman was to clear a path in the undergrowth and lay out cable (wire) that was on heavy spools over long distances so communication was kept open at all times – providing essential communications between units serving in the area. Sometimes this was done in mud up to his knees and he often had to walk through waist deep water to lay the cable. No matter how fatigued he was he had to maintain communications. Japanese snipers were often ready to attack. If a line was cut or broken he had to repair the break, often at night and aware of the fact he could have been ambushed at any moment by the Japanese who had cut the line. He told me of a New Guinea Native called Booga who saved his and the other members of his sections life several times and who, when dad and his fellow soldiers were coming home at the end of the war, begged to be taken home with them. He said it was very sad to have to leave him there. He was at Ramu Valley in early 1944, the same time as his brother Keith, a gunner of the 12th battery, 4th Field regiment. During this time he was wounded (head injury) and was hospitalised at Lae for some time. He returned to active duty and remained in the army until his discharge in November 1946 after serving 1320 days. His principal units were the 12th Australian Lines of Communication Signals, Anti-Aircraft and Forts Signals Eastern Area, the 14th Australian Line Section, the 19th Australian lines section and the 18th Australian lines Section and Army Headquarters Signals. The Medals awarded are: 1939-45 Star, Pacific Star, War Medal 1939-45, Australian Service Medal 1939-45, Australian Service Medal 1945-1975 with clasp, PNG and the Active Service Badge. Not long after his return from the war he met up with Lois again and in November 1947 they married. The following year dad accepted a job in a timber mill at Narbethong, east of Melbourne, for a couple of years. Then, on his return to the city he became a panel beater / spray painter, an occupation he still dabbled in occasionally right up until last year. He was always willing to fix cars for his family and friends, only charging them for the parts not his time on most occasions. He loved all sports but especially football and cricket. He made lots of friends through football who also became his life long friends. He played football while in New Guinea and on his return, for Camberwell, Woori Yallock and the East Hawthorn football clubs. He often went out in the bay with his friends fishing, another favourite pastime. As a child he and his brothers were always fishing, they would even walk from Hartwell to St Kilda to do so. His love of fishing rubbed off on his son and his grandson. In the 1980’s my brother Graeme purchased the Menzies Hotel in Dergholm and Dad loved to go and visit him and help out. A few short years later, in Dec 1987, Graeme died in a car accident. Graeme’s death devastated both Dad and Mum. It was the first time I had witnessed my father cry. 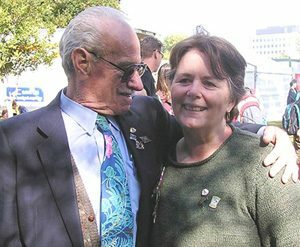 He spent many months after Graeme’s death helping Graeme’s wife with the day to day running of the hotel – until she was able to sell it and return to Melbourne. When Dad gave Graeme’s daughter, his granddaughter, away at her wedding, it was a very proud day for him. Dad was an avid reader and had a large collection of books, many of them on the war in New Guinea. He was very proud of his war service. Dad joined the Box Hill RSL in 1956 and was active in their cricket team for many years. He was also a founding member of the Upton house group. He donated many items of memorabilia to the RSL, back copies of “Mufti”, a pair of riding breeches used by a light horseman in WW1 and Documents and newspaper articles about the 3 Div Signals (2nd AIF). The RSL was a very big part of his life and he remained a staunch supporter of the RSL, enjoying a few beers with his mates until his last visit there in November. The month before he had been presented with a Long Service Award in recognition of 50 years continuous service. He was very kind and a real gentleman. He was a good friend to many. If anyone was in need, Dad was there helping in whatever way he could. He had a great sense of humour and loved a joke. He was also a master of Rhyming Slang – Saying things like – “Dogs eye and dead horse” for a pie with sauce, “Bag of fruit” for a suit, and Your old pots and pan for “your old man”. Dad died early in the morning on New Years day (2008), 2½ months short of his 83rd birthday. He had fought a long battle with cancer. He never asked for help and would suffer in silence, battle on, believing he’d be okay. Up until the week before his death he believed he would beat it; “if only I could get rid of this fatigue, I’d be okay”, he’d say. NOTE: The picture of the soldier on the radio in the video is Alan’s brother Keith, who was in the Ramu Valley at the same time as Alan.